When it comes to a whiskey’s profile, grain bills can only tell you so much. You can draw certain generalizations about flavor profile if you’re armed with the knowledge that there’s a sizable percentage of rye, or wheat, or oats, or malted grains involved, but “generalization” is where it ultimately ends. It’s also where X-factors begin, ranging from the character of specific grains, to the intricacies of fermentation, distillation and especially aging. By the end, it’s hard to know exactly what kind of character is going to be captured, even from a mash bill that seems familiar. So it is with this wheated bourbon from Charlottesville, VA’s Ragged Branch Distillery. The indie operation, which also sells fresh and frozen beef from its pleasant-looking farmhouse distillery, has captured something unusual and distinctive in this bottle, which was recently released for the first time in a four-year-old expression. It may not be for everyone, but it’s certainly one of the more interesting drams I’ve sampled in recent memory. 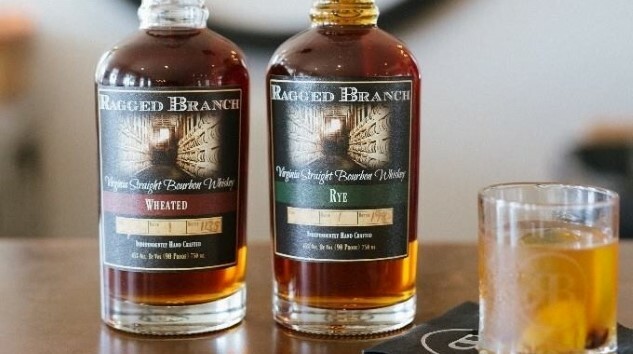 First, the basics: Ragged Branch currently produces a wheated straight bourbon and a high-rye straight bourbon, with a “cask strength” bourbon and straight rye whiskey to follow. Mash bills don’t appear to be available for either bourbons currently produced. The whiskey is sold throughout Virginia, and both are bottled at 90 proof, selling for an MSRP of about $50 per 750 ml bottle. That puts the whiskey well above the range of comparably aged bourbons from big distilleries, but given that Ragged Branch’s product is home-distilled and not sourced, and aged the slow way, in 53 gallon barrels, they’re earning at least some right to charge a premium. I must admit something: The first time I tasted the sample sent to me of this particular wheated bourbon, I didn’t exactly react favorably. I was initially overwhelmed in particular by one aspect of its flavor profile, which is the doughy, “breadiness” with which it presents. This is something often present in wheated bourbons, but Ragged Branch’s wheater hits this particular note with an intensity not seen in the likes of other popular wheated bourbons such as Maker’s Mark, Larceny or W.L. Weller. I was almost ready to write Ragged Branch off, in fact … but then I tried it a second time, a few nights later. And upon reflection, it began to grow on me. On the nose this wheated bourbon presents very grainy, with a bready/doughy character of fresh bread, complemented by a ribbon of vanilla bean and backbone of caramelized sugar. It reminds one perhaps of cream of wheat, or a bowl of Cheerios—positively “yeasty,” if you will. On the palate, however, the bourbon begins to open up past its inherent doughy-ness. Sweet cornbread and honey notes mesh well with light caramel and black pepper spice. It’s a bourbon on the sweeter side, but it stops well short of cloying, with a well-incorporated, moderate alcohol heat. Probing deeper, I get hints of apple fruitiness, grass and floral notes—a profile that, along with the honey note, almost reminds me of what you often see in the increasingly popular “American single malt” style. In fact, rarely have I ever had a whiskey that put me more in the mindset of craft beer than this one. It’s like the distilled equivalent of an amber wheat ale—malty sweet, with hints of spice, fruit and bread. It’s the dunkleweizen of whiskeys! That description isn’t traditionally the kind of whiskey that is in my wheelhouse, per se—it does make me curious about the distillery’s high rye bourbon—but the more I drink it, the more I admire the unique approach that Ragged Branch has harnessed here. I think there are a lot of people who may find this intriguing. If wheated bourbons are your thing, this is a bottle worth seeking out, to experience that uniqueness for yourself. Who knows—it might make a believer out of you.